If there's one thing which most impresses me about a movie is when it manages to keep me engaged for its entire running time and then drops a bombshell of an ending that has me pining to see it again. So it is with A.D. Calvo's new thriller The Midnight Game. It all begins rather simply. Kaitlan's mom is out of town for the weekend and the teenager is having a couple of friends over for the night but of course being teens, even responsible ones, the girls' night in is trumped for a night in with potential boyfriends. After a few drinks Shane, one of the boys, suggests that they play a game he read about on the internet. Originally intended to teach kids how to obey the rules, the midnight game is pretty simple: light a candle, write your name on a piece of paper and then make sure your candle doesn't go out and if it does happen to go out... the midnight man will haunt you with your worst fear. All is light hearted in the beginning after all it's just a stupid game, nothing more than an urban legend, but when the group hear noises upstairs, they begin to think that maybe there is some truth to the game and rather than take any chances, they follow the back-up plan, drawing a large salt circle and not moving outside of it until 3:33AM. When the lights come on at the appointed time, all seems well but a series of events which unfold the following morning suggest that something is amiss and in desperation, the friends re-enact the ritual, hoping to right the wrongs from the night before. What they don't realise is that they're already beyond help. The Midnight Game could easily have gone the route of violent horror movie but instead, director A.D. Calvo delivers a moody thriller that relies more on ambience for scares than gore and blood. There are a few bloody images but Calvo is far more interested the overall tone of dread that permeates throughout the movie than in delivering graphic violence and the choice works beautifully. The camera moves slowly and occasionally at strange angles and in combination with the music, builds tension and a sense of impending horror better than any single image. One particularly fantastic sequence comes the morning after the ritual when Rose makes her way through the apparently empty house in search of her friends. The camera follows her at a short distance, occasionally changing angles and locations and accompanied by Joe Carrano's haunting score, I found myself leaning forward in my seat, preparing for the worst. Though the acting is occasionally flat, particularly in the opening exchanges between Kaitlan and her mother and later between the friends as they await the arrival of the boys, the actors seem to find their groove once the game begins. Valentina de Angelis as Jenna is particularly good. Her ultimate fear is insanity, something which runs in her family, and she has some great scenes where she fluctuates between concerned and crazy. Ultimately The Midnight Game ends in great, unexpected fashion and though the movie's final moments may anger a few who will complain it's a sell out of an ending, keen viewers will be rewarded for their attention to detail. I can't wait to see what Calvo has up his sleeve for House of Dust (trailer). 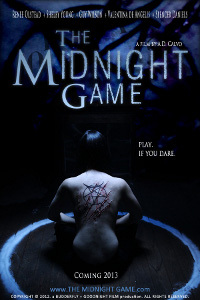 The Midnight Game will have its world premiere at the Miami International Film Festival.